If you are looking for some excitement and possible danger this is where you want to be. 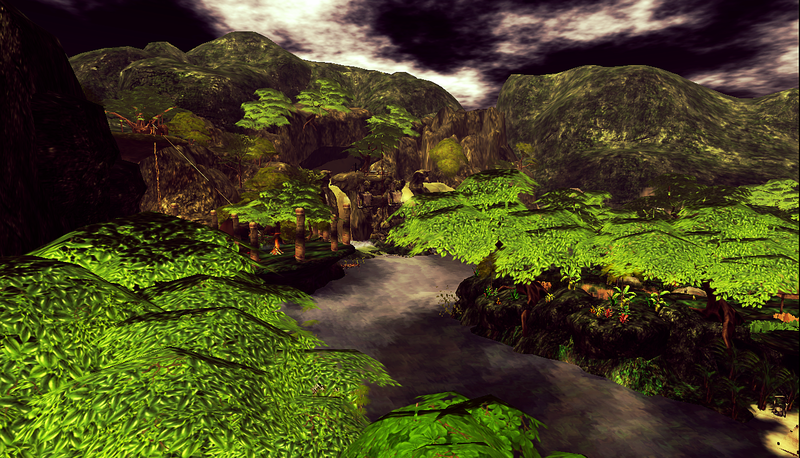 Welcome to The Amazon Rainforest ~! This place is intense. When I landed I was not expecting it to be as crazy and exciting as it turned out to be. 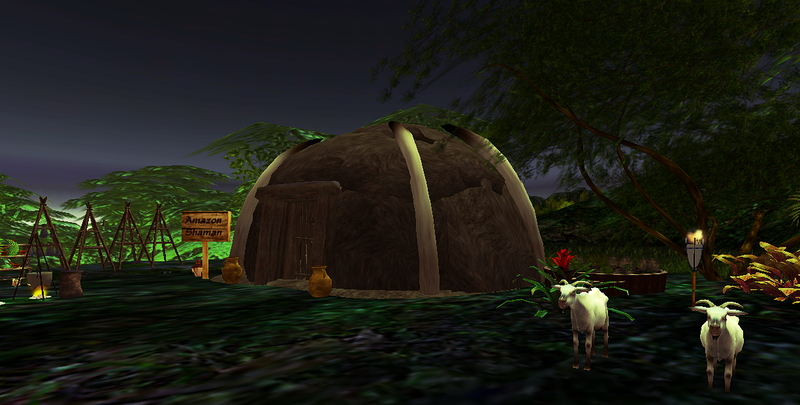 When you land here, you will see some signs near you explaining a bit about the land. There is a HUD you wear so you can fully immerse yourself into this area. Make sure to grab that off of the tall sign near the landing. And I also came near this random opening in a mountain. There was a camera above the entrance, so I made sure to pass by carefully. Hopefully this wasn’t an entrance for loggers living in the area…. After my tour through the water I decided to hop off the kayak near by and started to check out the area by foot. 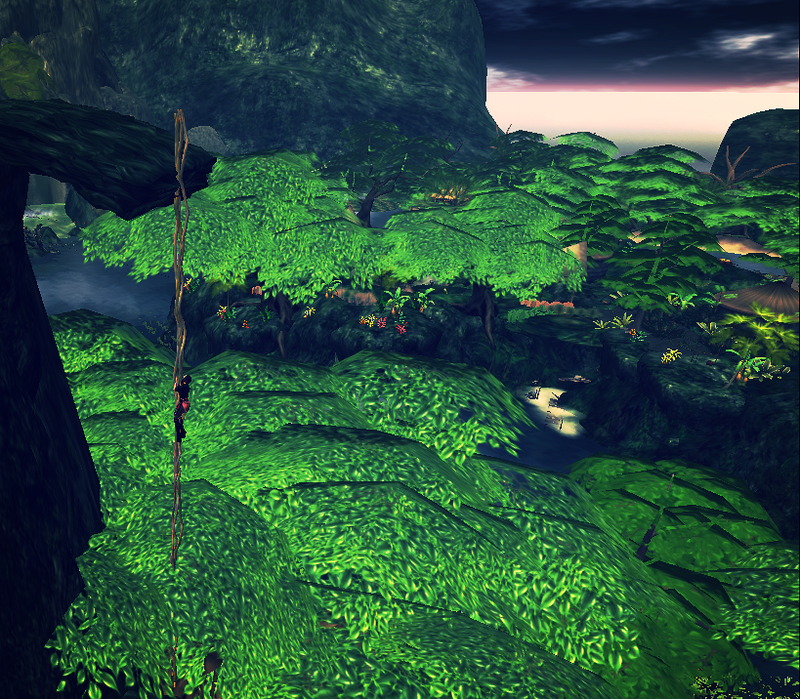 This is a giant 5 SIM Forest, so there is plenty to view while you are here. As I was wandering around I found some villages, and I was glad to see that they were all very friendly to me being a new comer. I just let them know I was exploring, they wished me well along with warning me to be careful about the dangers in the forest. I said thank you and headed deeper into the forest. 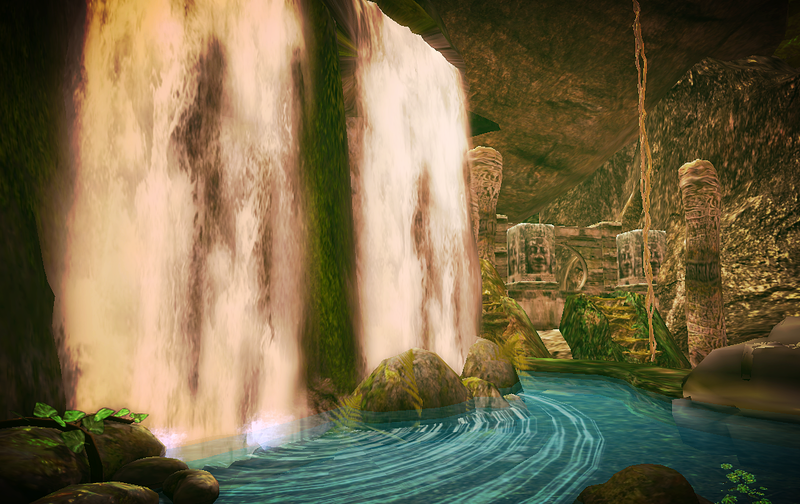 I found myself passing by beautiful ruins and waterfalls. 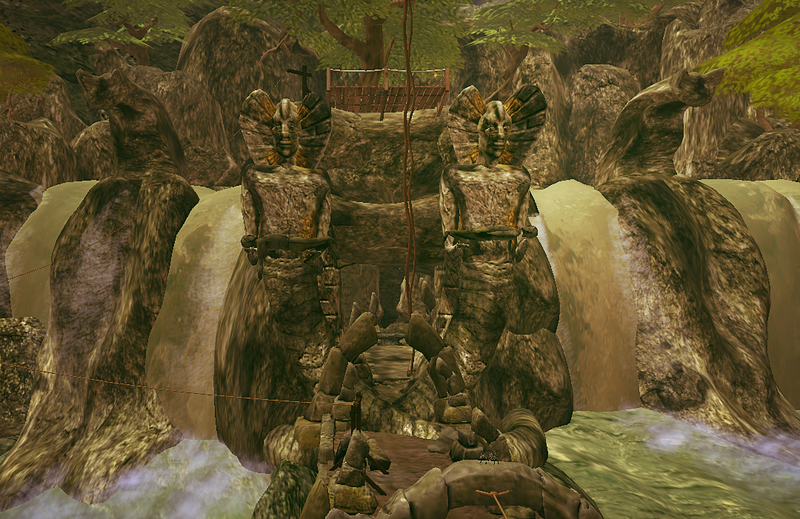 Near this waterfall I found a Giant Ruin with two Snake people statues outside the entrance. Definitely frightening, but I headed towards them from my curiosity. 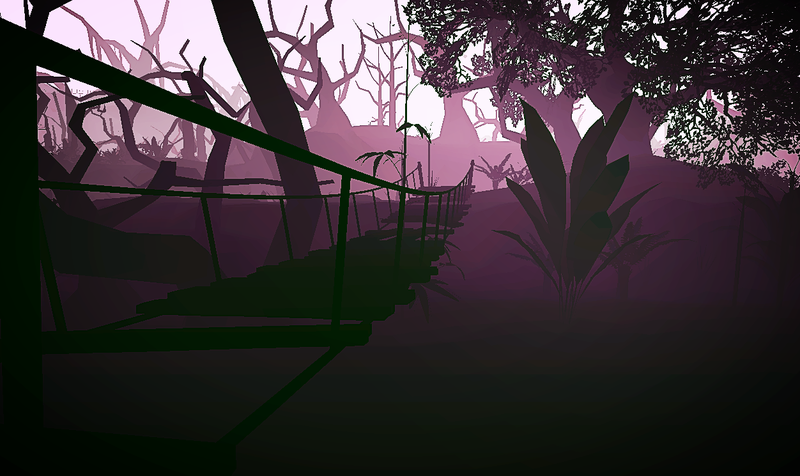 This was a very spooky looking area. Not far from here I found a giant Mayan Temple, that even had a secret passageway ( I will leave the entrance for you to find 😀 ). 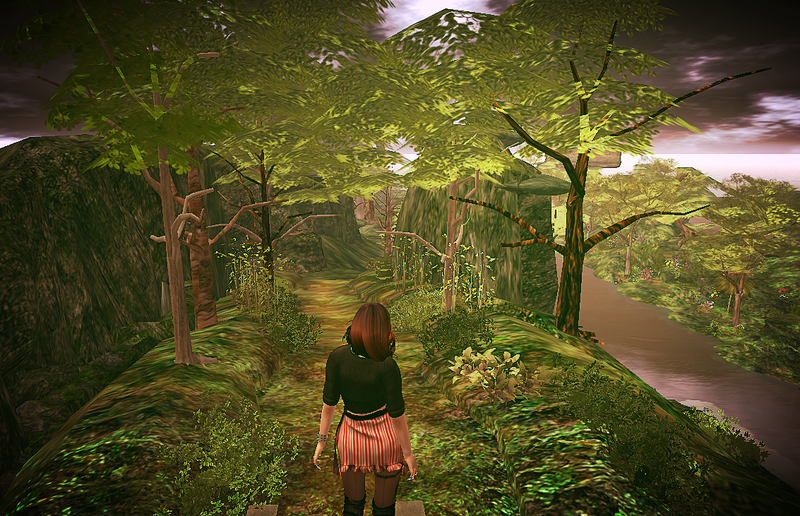 Then I started walking through the lush forest my eyes wide with everything I’ve already seen, feeling way to comfortable with my surroundings. I ended up getting chased by a crocodile!!! 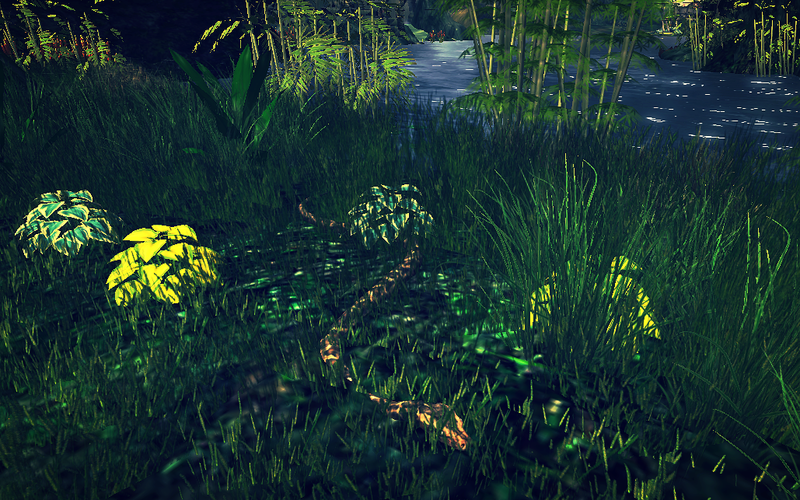 And as I ran away out of terror, I stepped onto of a snake. Which pissed him off and I was bit. Things were blurry and slightly blank. Now being injured and a bit woozey, I’m glad I still manged to get away. 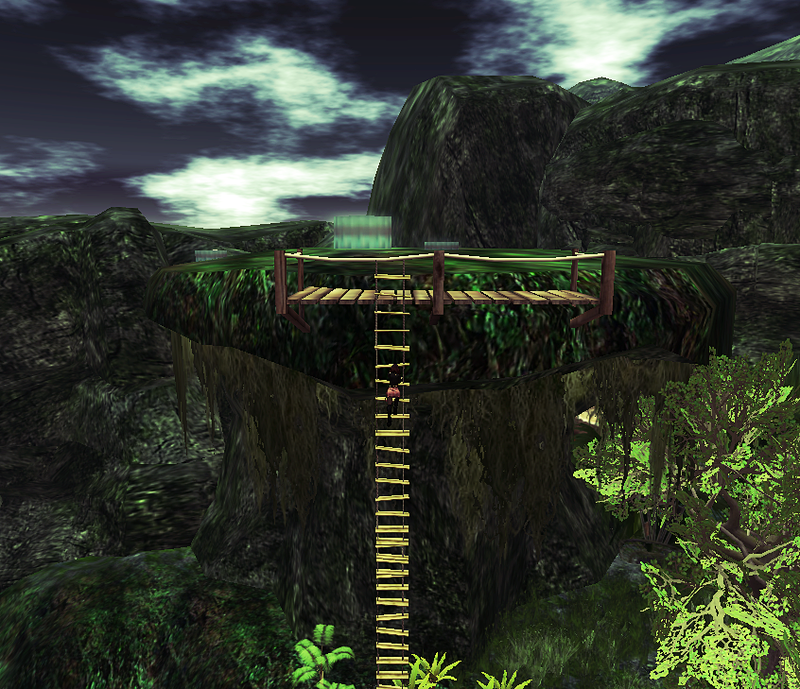 I found a nearby rope ladder and headed for higher ground. The site was amazing from here, being able to see the entire forest. 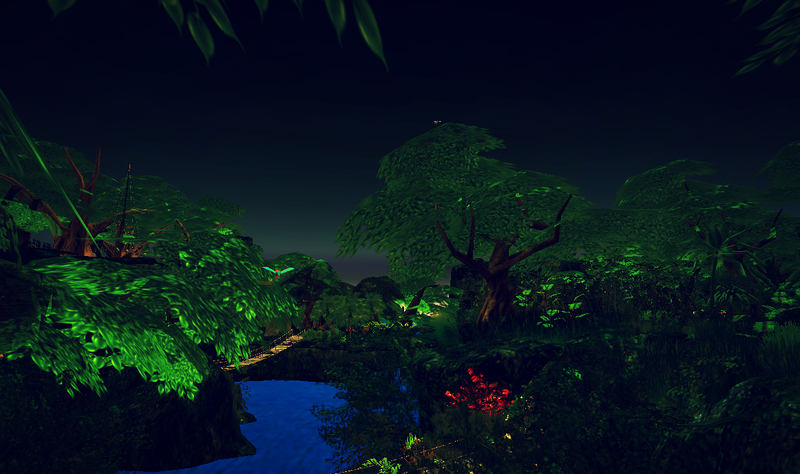 I spent the last of my adventure sitting above the canopy, taking in the beauty that I saw all around. 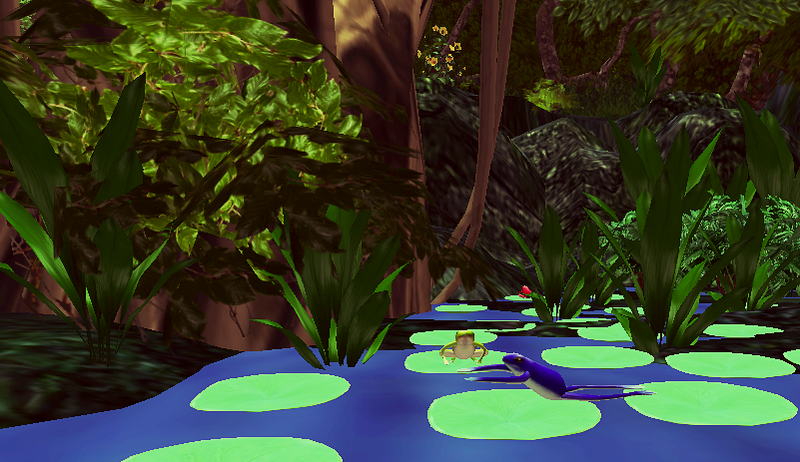 So, now you know what awaits you in The Amazon. I say go for it, there is so much beauty to this place. And so much more left to see. I hope you all take a chance and head into the jungle. You never know what you may find. But, you wont know unless you go. 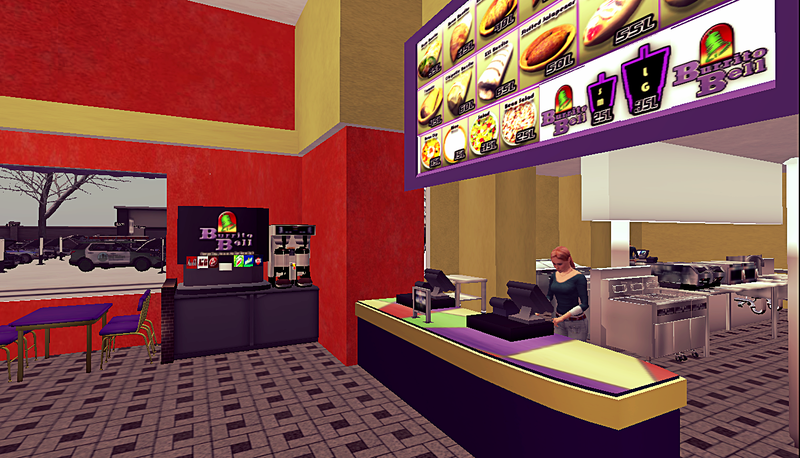 So I’ve been doing some searching, to see if there are any fast food chains in SL. 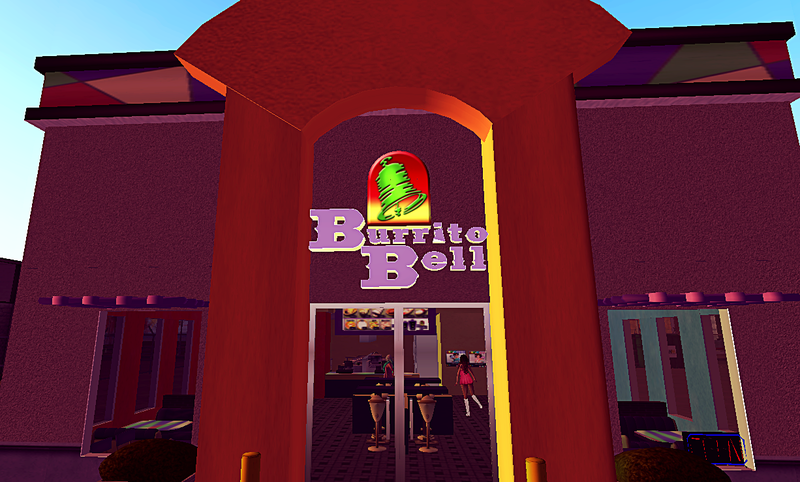 Well, in Second Life we have Burrito Bell instead. The fun thing is here, you can even hop in the back and act like your an employee if you want. 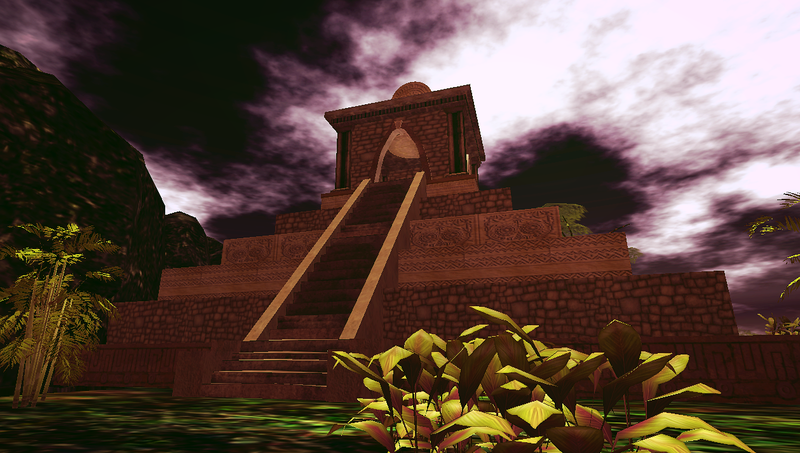 I think its pretty cool that this exists in-world. Instead of trying to hunt down a restaurant or something like that. 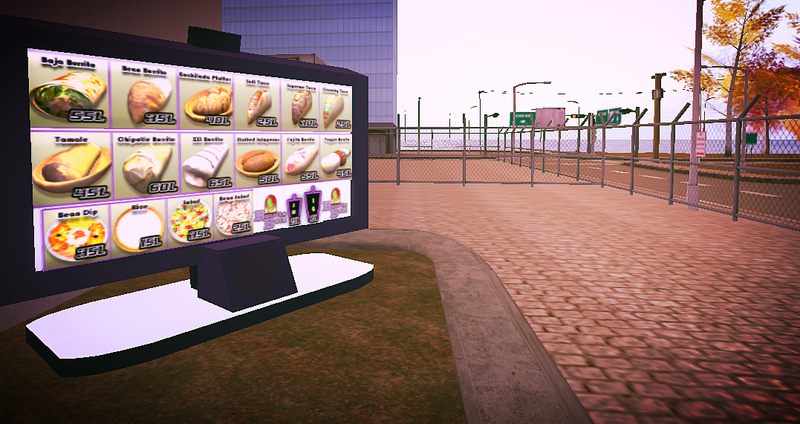 It seems a lot of food places In-world are set towards romance or special events. But, this is a great place to bring family and kids. And you don’t have to be dressed up any certain way to go here. There is even a drive through. So you can take a car and swing by to grab your food. 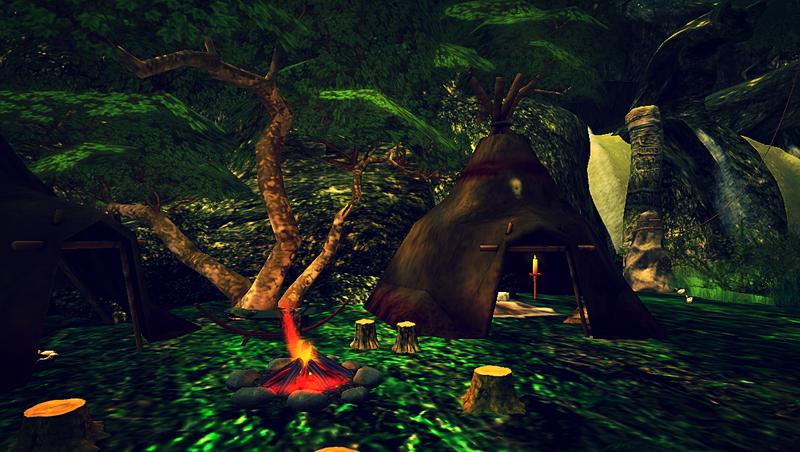 But, to do this you’ll need to join the group on the SIM to rez your car on the land. 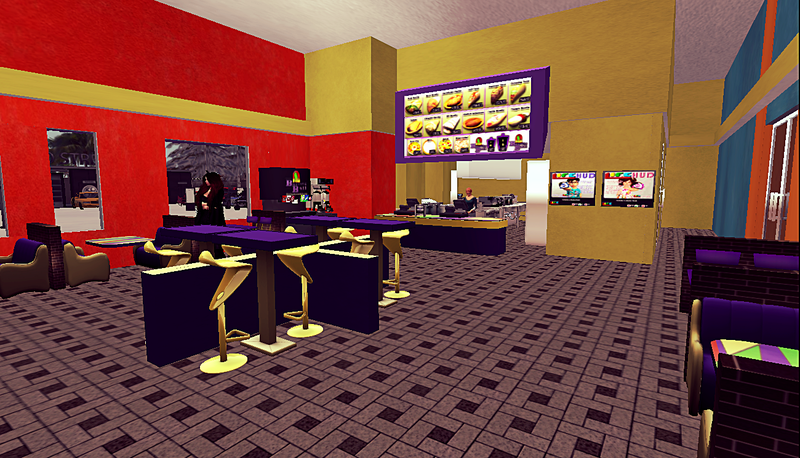 Theres plenty of seating inside too if you want to eat inside. 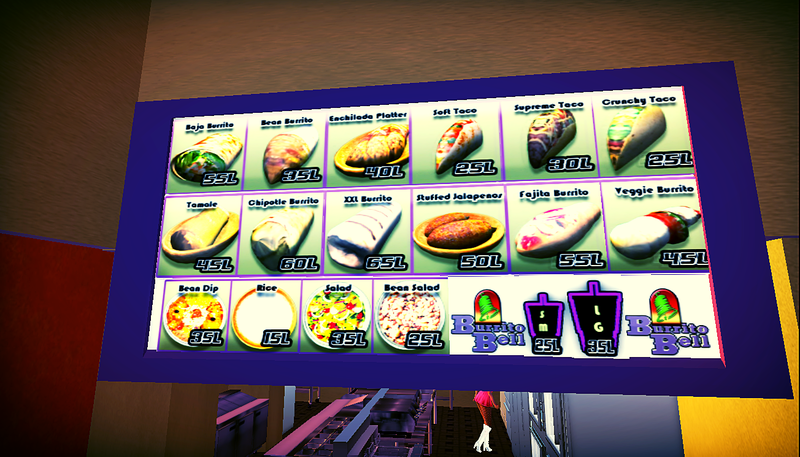 And here are all the menu items, and the drink options are to the left of this sign. The reason I started searching for any food chains, was because I was all excited when I saw that Taco Bell has a new app where you can Get a free Doritos’s Loco’s taco when you order off the app. Haha I love those things, so I grabbed it up. Apparently they are going to be doing this until they hand out 1 million tacos.